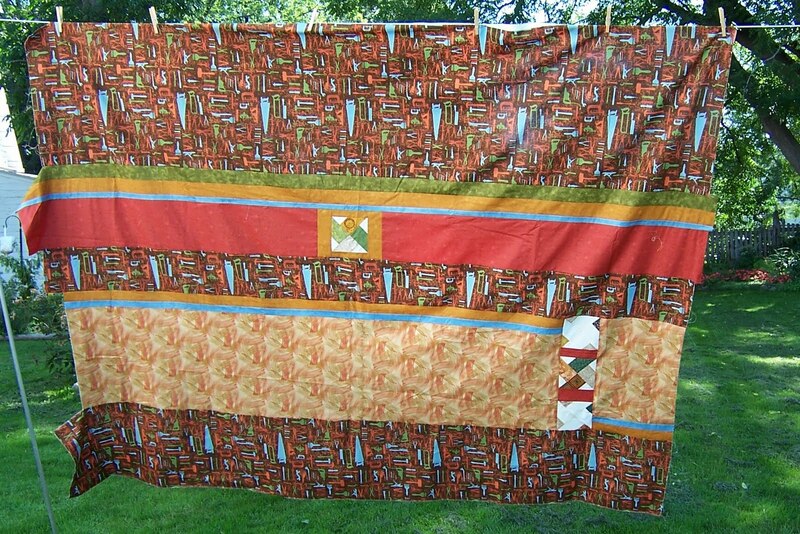 This flimsie above pairs up with the pieced backing below and I hope to have it quilted and delivered to Dad in mid-October when we go visit. 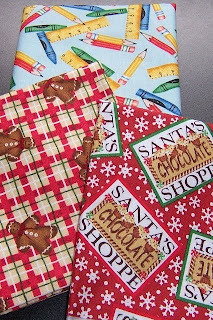 If you do a closeup look on the backing, you can see the tools on the fabric - I had to do a bit of creative piecing to get it wide enough - and then had to piece again when I mismeasured the first insert... but I like how it turned out. It used up a few of the extra blocks I had made. The lighter large piece of fabric near the bottom is brush strokes so looks like it was paintbrushed - a great fit with the tools. Thanks again to Jill for her fabric shopping - and then sending me the extra piece of the dark rust that she had bought for herself so that I could eek out enough borders for the top, and extra for the back. 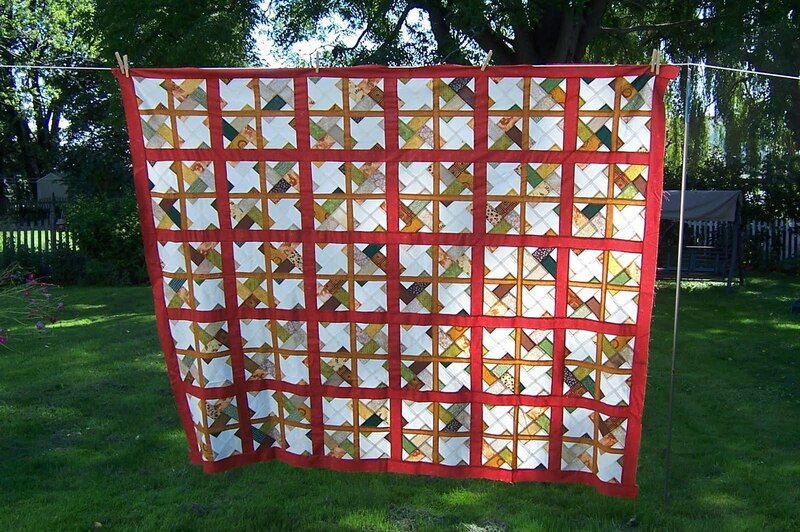 Unfortunately the block formation method I am using does not allow for a seam allowance to enable the unsashed tesselation I fell in love with a month ago. 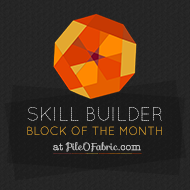 I believe that a paper pieced version of this block might allow that - but I had already committed to this method in a big way (like in 120 blocks big) before I realized the situation. 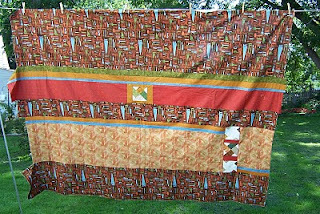 A shipment of fabric from my personal buyer Jill that was destined for the back now moved to the front -and lots and lots of sashing was added - increasing the quilt size by nearly 18 inches side to side, and 21 in length. 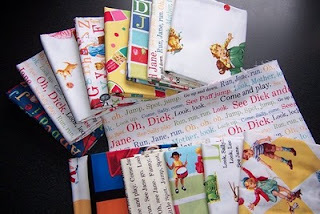 I still have enough for the back - although I did need to "reorder" from Jill to finish up the borders all around. This is now big enough for a twin sized bedspread I think - although I have not made final measurements yet. It's been more sewing than I originally envisioned - but I am still loving the colors and the scrap-bustyness of it all, and can't wait to give it to my Dad in person when we visit in October. A bit late for the August birthday (Happy belated birthday, Dad) but I like in person deliveries best. More pics to follow when I can hang it up outside and get a full length shot on the camera instead of on the cell phone! Then to figure out how to quilt this one! I am disappointed -a bit. I love summer squash - especially zucchini - but recently have gotten hooked on yellow summer squash as well. 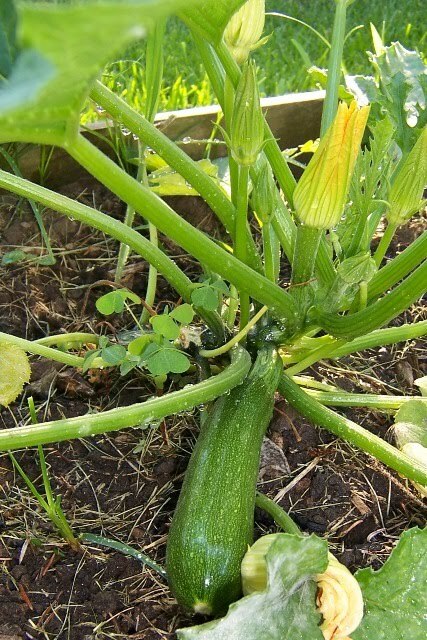 In planning my garden this season, I left room for 2 yellow squash plants, and 2 zukes, as well as 2 melons (cantaloupe - yummy). (Small garden - so I plan things out pretty tightly). Unfortunately the bugs/borers decided my garden looked mighty tasty, and all I have left is one lone zucchini plant. One producing delicious, small, tender squash. Yummy - but about one per week - far less than I had anticipated. We supplement of course - the Saturday AM farmer's market is great for more small squash, and co-workers and other daycare parents have been more than generous with the large ones. You know - the 'bigger than a baseball bat' ones? The 'whoa how did it get that big' ones? The "awesome for zucchini bread" ones? Pour into 2 loaf pans. Bake at 325 F for 1 hour. Any questions? Let me know. Any samples? Send them this way! Any extra squash? You are on your own! So last week I got to go on my 3rd annual "one woman shop hop" - last year I went a bit crazy and did this. The year before it was this. This year I got a bit of a later start. 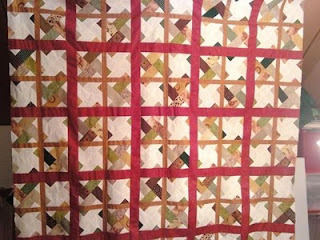 Due to a picnic the night before (at which a dear friend announced her engagement and I started planning a wedding quilt), I slept in a bit. On and off torrential rains, and the need to pick up a package from my personal shopper Jill at the post office and bring it home to open it before departure, put me about 45 minutes behind schedule. Early on I made the decision to stop at only 2 shops instead of 3 or more. I was flying pretty much without a list (some would say without a clue!) and was keeping an open mind. 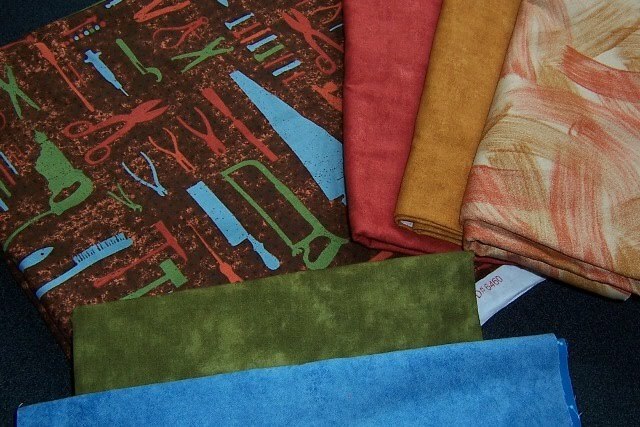 The first thing I was looking for was fabrics to go with this tool fabric. Or so I thought. The package from Jill had contained the three fabrics to the right - which I could not have matched better! They are perfect!!! 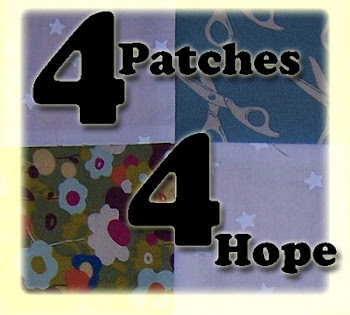 These will help to piece the backing for this quilt. But I wanted just a little bit more contrast, so picked up the green and the blue. 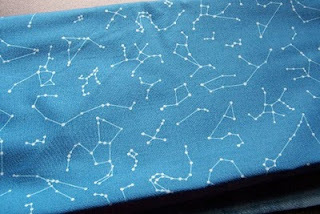 There is enough of the green to use as the binding, and I will put in just a smidge of the blue in the back. So I continued to browse the store - Mt. 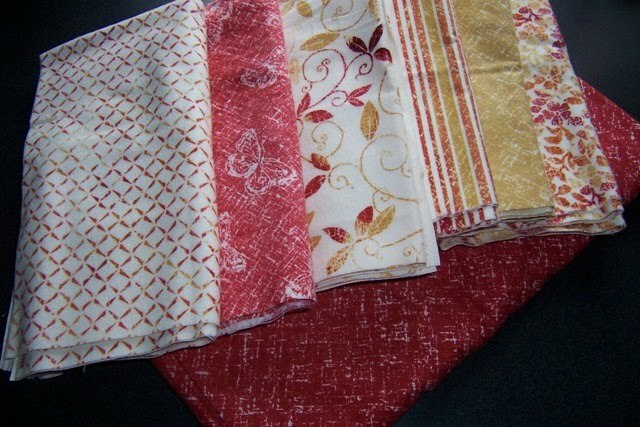 Pleasant Quilting Company - and these just fell off the shelf into my arms and right over to the cutting table. They were so new in the store that mine were the first cuts off each bolt. Super soft flannel - yum! And I love these colors. 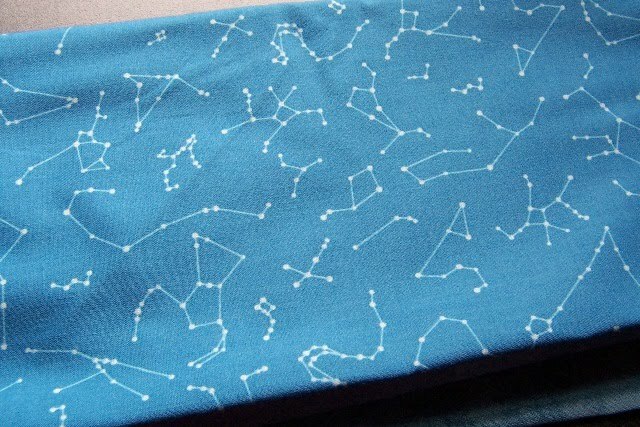 One more quarter yard cut of this great constellation fabric to make a pillowcase cuff for the Munchkin, and I was done here and back on the road. I hit a few more rain showers, and then it was HOT and HUMID the rest of the day. It was very refreshing to pull into Sew Pieceful and be offered a glass of lemonade while browsing. Such awesome people at that shop!!! Love them! I found a super duper special bargain there! 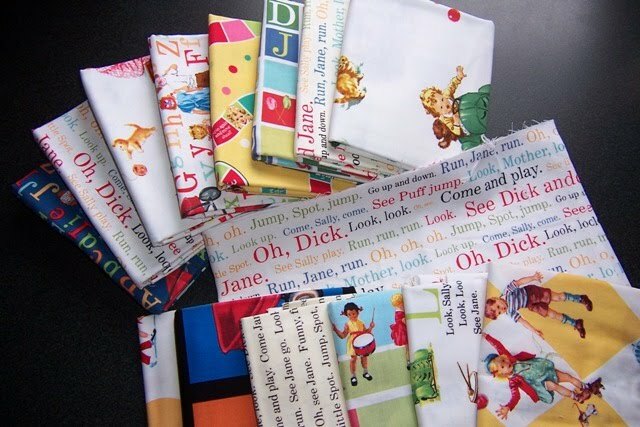 I was looking for fabrics to do a baby quilt for Toshi and Miyuki and wanted something very "English language" with the alphabet, but with soft colors. We don't know if it will be a boy or girl but I did not want to wait until after the baby is born (November) to do something. I finished up the day with a buy 1 get 2 free summer shoe sale at Bass. :-) Oh -and a long meeting. But it was all worth the trip! Hubby and I have been growing basil as many years as we have been married. Every year we put in one or two plants, every year we harvest a few leaves here and a few leaves there, every year we talk about getting enough leaves to make pesto, every year we have the mentality of waiting to harvest the plant, and every year our plants go to seed before we seem to do much with them. 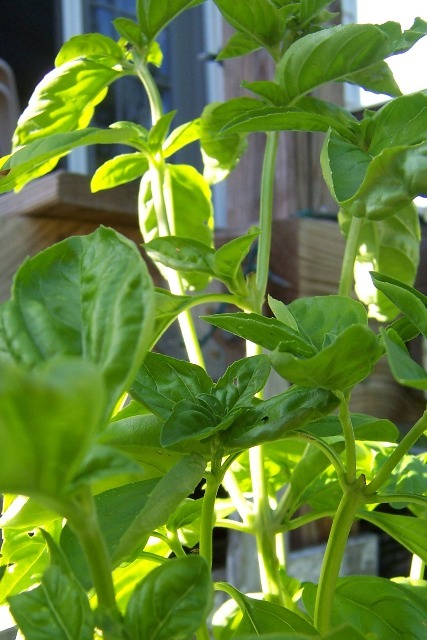 This year we started by planting more - starting with 6 sweet basil plants from Zantopia (wonderful garden shop if you are ever in the area), and a basil plant I got from a class at RIT. Then my wonderfully green thumbed neighbor gave us even more. A whole bunch of little bitty basil plants she started from seed. They all grew! So this year not only do we have a larger quantity of plants, but we have a bit more know-how. 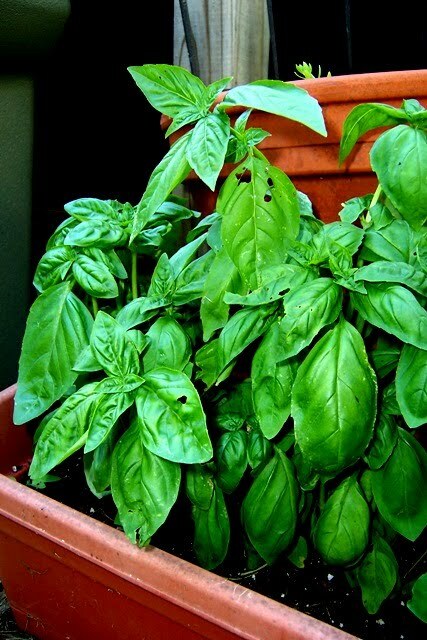 I did some digging around for the optimal way of harvesting basil, and came up with this great tutorial. So I started doing things their way - and the plants have been very responsive. We are 3 batches of pesto into the season - averaging about a batch a week - and I have only had to pinch off one or two flower heads. The plants are full and happy, and we have a growing stash of pesto cubes (pesto frozen in ice cube trays) in the freezer. Lots of pesto recipes out there - we are currently enjoying this one. 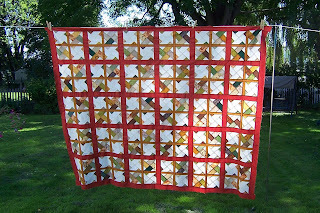 Yes - a recipe from another quilter - how perfect is that! Now if only all my gardening troubles were that easy to solve!